CHARLOTTE, N.C. (AP) — Cam Newton can’t keep from grinning when he looks around at the playmakers that surround him in the Panthers‘ locker room. “The talent level we have on this team is extremely scary,” Newton said. Newton completed 19 of 25 passes for 247 yards and two touchdowns, running back Christian McCaffrey racked up 157 total yards and scored twice and second-year wide receiver Curtis Samuel scored on a 33-yard double reverse and hauled in a 19-yard TD catch midway through the fourth quarter to seal Carolina’s 42-28 win over the Tampa Bay Buccaneers on Sunday. Even a little “Fitzmagic” wasn’t enough for the Buccaneers (3-5). Ryan Fitzpatrick, who started in place of the turnover-prone Jameis Winston, finished with 243 yards passing and four touchdowns — two each to Adam Humphries and O.J. Howard — and led the Bucs back to within 35-28 in the fourth quarter before running out of steam. 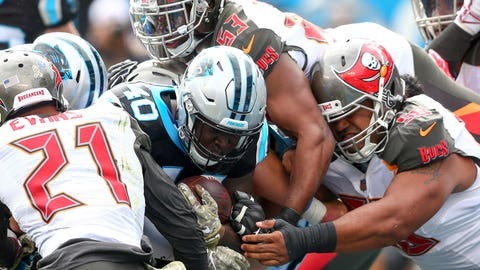 Fitzpatrick threw two costly interceptions — one on the game’s second possession which led to Carolina’s first touchdown, and other late in the fourth quarter that sealed the Bucs’ fate. The deficit — and Carolina’s offensive firepower — proved too much. Tight end Greg Olsen called the versatility the Panthers now have on offense with players like McCaffrey, Samuel and D.J. Moore is unlike anything he’s seen since his arrival in Carolina in 2011. McCaffrey leaped a defender on a reception in the flat and kept going, racing 32 yards for a first down. Samuel’s 33-yard TD on the reverse included the speedster reversing field and running a combined 103 yards , according to NFL’s Next Gen Stats. And Olsen, the cagey veteran, hauled in a one-handed catch in the end zone — his third TD in three weeks. “We were playing with momentum and when you’re playing like that, we have a lot of juice coming our way so it does make it very fun,” McCaffrey said. Panthers defensive end Mario Addison had a big game with three sacks to raise his team-leading total to 7½. The Panthers have been touting James Bradberry as their shutdown cornerback and he did quite a number on Tampa Bay’s Mike Evans, who finished with one catch for 16 yards despite being targeted 10 times. “The secondary is shaping up nicely and the more they play together the more chances they will have,” Rivera said.